This beautiful 5 bedroom, 4 bathroom home is a unique escape and sure to be a memorable one! This home has a private beach that runs the length of the property with sand as soft as you'll find in the Bahamas. Spend the day in the private pond swimming, kayaking and paddle-boarding. When you are ready to explore away from this awesome beach house, you are minutes from the base of the Gallatin Mountains and vast trail system. Grab your hiking boots or mountain bike, and enjoy the great outdoors not far from your front door. Hyalite Canyon and Reservoir are only a short drive away from the home as well. You can rent a paddle board, canoes, or kayaks during summer months and head to the Reservoir for a day in the sun. During winter months, you can rent cross country skis or snow shoes and trek across the vast landscape in the Canyon for the day. When you come back home, enjoy the fire pit down by the pond, behind the home. 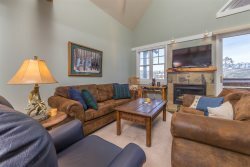 This home is also located just a few minutes from downtown Bozeman, allowing you to enjoy the unique nature of the city through the local restaurants, boutique shopping, small-town theater and shows, the Farmer's Market, and so much more. Wonderfully adorned with artwork throughout, the home is full of color and light. Each room is unique with special features to make it perfect for each guest. The first master bedroom is located on the first floor, right off the dining and kitchen area, and is private from the rest of the bedrooms. It is equipped with a full bathroom, including a shower/bathtub combination and two sinks. It also has a flat screen TV to enjoy the satellite channels from your room. The second master bedroom has its own private balcony with French doors opening to enjoy the views of the pond and Bridger Mountains from the second floor. It has a large bathroom with a walk in closet area, jacuzzi tub, separate walk-in shower, and two sinks. It also has a flat screen TV and DVD player. The third bedroom is just down the hall from the second master. Equipped with a pink dresser, a twin-sized bed, a small table and chairs and a doll house; this room is perfect for younger children. The fourth bedroom similarly appeals to children, equipped with an elevated, full-sized bed with a ladder and a dresser. The fifth bedroom is equipped with a full-sized bed and dresser, and the two windows grant a great view of the pond. The home has an open floor plan between the living room, dining area, and kitchen, making it perfect for hosting a get together with family and friends. French doors off the dining room open up to a large deck, where you can enjoy an afternoon BBQ. There is a gas grill available for your use and even outdoor space heaters for those cool evenings in the spring and fall. There is a diverse library with an assortment of books to enjoy on the second floor, and a quaint reading nook on the third floor with an amazing view of the Bridger Mountains. In the summer months, the balcony right off the reading room is a great place to spend your time engaged in a good book or enjoying your morning cup of coffee. During the heat of the summer, you can enjoy the private pond located out the back of the home, equipped with a canoe for your enjoyment. You can also rent ice skates and enjoy some ice skating on the pond during the winter months. - Gas Range, Food Warmer, Oven/Stove, Dishwasher, Refrigerator, Microwave, Keurig Coffee Maker, Tea Kettle, Toaster, Crock Pot, Blender, Roasting Pan, Bakeware, Cutting Boards, Food Storage Containers, Basic Spices, Dinnerware, Silverware, Steak Knives, Trash Bags, Dish Soap, Dishwasher Soap, Sponge, and Paper Towels.